Here are some of my favourite juicing detox recipes, they are all quick, easy and inexpensive to prepare. Lets face it if your anything like me once I set my mind on carrying out a detox I just want to get on with it. After all too much thinking and researching may put me off the idea or mean I’ve run out of time. So below I’ve listed some recipes and made a few notes on why they should help you on your juicing detox. They all make approximately two glasses. This juice is packed with all the classic fruit and vegetables for a juicing detox. The carrots will provide you with vitality and stamina, as well as containing many vitamins and minerals. The pectin from the grapes will aid the cleansing process, as will parsley as it’s rich in antioxidants. Finally the celery will give you a calming effect. Drink this juice regularly to give your system a through clean out. In the photo you can see what it should look like when you’ve made it. Wash and roughly copped all of the fruit and vegetables listed above. Place through your juicer in any order. Remember to juice the parsley with the stalks on, as this is the part of the herb that contains lots of the goodness. This is a powerful little juice with lots of amazing detox qualities. Parsnips are good for hair skin and nails. Parsley provides a rich source of vitamin A. Pear is a detoxifying fruit that also provide an energy boost. Fennel is an excellent support for the liver and gall bladder. Plus you have the all-important pectin in the apple. The parsnips provide an intense sweetness to this juice, perfect if you’re craving sweet things. Place through your juicer in any order. Serve in small shot glasses and add crushed ice. 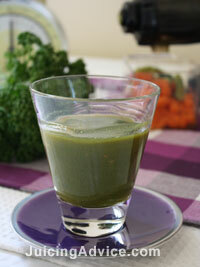 Wheatgrass contains an enormous amount of nutritional benefit so it’s one of the perfect juicing detox recipes. It contains a concentrated source of chlorophyll, which helps to combat tiredness and fatigue, virtually a must for everyone I know then! Plus it provides a wealth of enzymes, minerals and vitamins. In this recipe it is combined with white cabbage to dilute the strong flavour it provides. But it works equally well when combined with other vegetables. Wash and shred the cabbage. Add to the juicer followed by the wheatgrass. ingredients for this recipe. Not all juicers can juice wheatgrass. Another great thing about the wheatgrass is you can simply cut off the amount of grass you require for each recipe then leave the rest growing. Perfect. The beetroot in this recipe is great for detoxifying the liver. The spinach is highly nutritious and rich in vitamins A and C as well as providing you with a source of iron. The orange will also give you a natural vitamin boost. But by far the most amazing thing about this juice is it’s colour. In my photo you can see it’s deep red colour which is truly beautiful. Not to be drunk when wearing anything white! Wash and chop the vegetables. Peel the orange and place it all through your juicer. Leaving the spinach to go through last. Drink and enjoy. Always remember to buy the raw beetroot as apposed to the cooked or pickled variety. Broccoli is though to be one of the anti-cancer foods it is also high in vitamin K. Bean sprouts are also thought to be an anti- cancer food. They are high in many vitamins and minerals including vitamin B and C. For all these reasons this makes it one of the perfect juicing detox recipes. Wash, chop and remove the core of the pear. Feed all the ingredients through the juicer and pour into glasses. This juice looks pretty when finished with ice cubes and slices of green grapes. 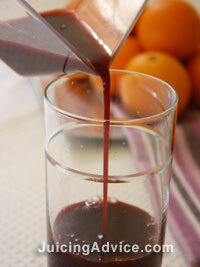 Get more recipe ideas from our main page on juicing recipes.